Once upon a time there were two sisters and both had magical powers. Their powers came from a very special magic dust that they had inherited from their father. A tiny sprinkle was enough to transform anyone into anything they wished. The two sisters were very wise and kept the magic dust hidden and only used it when it was absolutely necessary. That was how they were able to live such peaceful and happy lives together for so many years. When the sisters got to be quite old, they found that it was very difficult to keep up with all the housework like they used to do. They knew it was time to get someone to help with the cooking and cleaning, but they did not want to hire anyone from the nearby village because it would be so hard to explain the magical things that happened around the house. Then one day, the oldest sister had an idea. They didn’t need to hire someone from outside, they could just use the magic dust to make themselves a servant. So they went out into the yard and sprinkled some magic dust on a young pig sow and she immediately transformed into a serving girl. They took the pig-girl inside and showed her how to cook the dinner and wash the dishes and scrub the floors. Everything went along fine until the weather began to get cold and the apples were all ripe on the trees. Pigs are very greedy about apples. When the pig-girl went to market she would spend all her money buying bushels of apples and bring them home forgetting to buy flour and sugar and other necessary things. In no time at all, the house was stuffed full of apples. The sisters, at their wits end, finally ordered the pig-girl to make candied apples and take them to the village for the Halloween celebration. They thought it was as good a way as any to get rid of all those apples. When the pig-girl was making the candied apples, though, she realized that she didn’t have any sugar. She had been so excited to buy more apples last week that she had completely forgotten to buy sugar. Then she remembered seeing a box full of sparkling powder that looked just like sugar up in the attic the last time she had cleaned it. Without telling anyone, she hurried up and dumped that box into the pot of candy apple glaze. 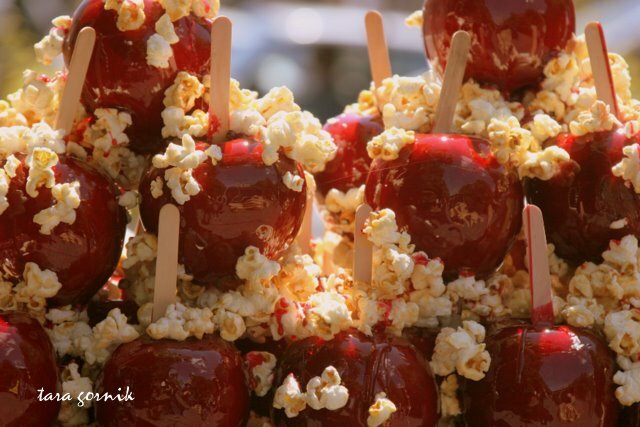 When she had finished dipping all the apples, those were the most beautiful candied apples ever. She licked her lips while she was packing them up and she would have eaten one if the sisters hadn’t come in right then to compliment her on her cooking and hurry her on her way. At the village, the pig-girl added the candied apples to the food table. They looked so shiny and delicious that they were quickly grabbed up by everyone, young and old alike. Everyone said that they were so sweet and light and crispy and flavorful that it was almost like magic. Of course, it was magic. That sparkling powder was the magic dust and every person who ate an apple was given the power to transform. Without anyone to say the magic words and tell what they should change into, each person changed into whatever they were thinking of at the time they ate the apple. First to eat was a little boy. He had been whining all day for food and drinks and candy and treats, and his poor mother was at her wits end. As soon as they arrived at the celebration, the little boy jerked free of his mother’s hand and ran straight to the big pile of apples. No one even noticed the him as he slipped under the table and crunched down on the apple. And no one noticed when, with a little POP!, he turned right into a big pile of candy. The next person to eat an apple was a young girl. She had been dreaming of having her very own pony. Everyone DID notice when a lovely white pony with braided mane and tail appeared at the party, but they all assumed someone had just brought it in for the celebration. The apples were disappearing quickly, and here and there people were being transformed. A young man suddenly grew a foot and big muscles popped out on his arms. A woman became as beautiful as a princess. Two men turned into goats and began butting horns at once. An old woman ate one and immediately she was forty years younger. She was so surprised that she started to look for the village doctor to ask him about it, but on the way she heard the dancing music start and she couldn’t resist joining in the dancing on young legs again. Hours passed before she left the dance circle. By that time, the ordinary village celebration looked like a circus. There was a juggling clown, a striped tiger, and a woman so small she could fit in the palm of your hand. Somehow someone had swelled up like a big balloon and was floating around, bouncing off tree branches and the roofs of houses. And invisible girl slipped in and out of the crowds, and a boy darted around running so fast he was only a blur. Several days passed before the pig-girl came back into the village to do her shopping. She couldn’t believe what she saw. A rabbit sat in the sheriff’s chair. The innkeeper was opening his shutters with hands that were solid gold. An old man flew (yes, flew!) right up to her and told her the whole story. Horrified, she ran straight home and told the two sisters all about it. Of course, the first thing the two sisters did was to get out their box of magic dust. And of course, it was empty. When they heard what the pig-girl had done, they were terribly angry. Then they laughed just a little. Then they began to desperately search for something to do to fix the situation. In one of their father’s old books, they finally found the recipe for a potion that could reverse transformations. Sadly for the village, it took about three months to brew. Still, the sisters went right to work. They also sent the pig-girl to the village to round everyone up and explain. It was a long three months in the village. Being made of gold and being able to fly are not really as wonderful as they might seem like they would be. Being a goat is not wonderful at all. Even being forty years younger is surprisingly tiresome after a while. Finally the day came when the sisters called everyone to their house to take the potions. Those that could drink it, did. Those that couldn’t had it poured over them. Soon everyone was back to normal, including the little pig running around in the sister’s yard. The sister’s did not try any more transformations after that. They hired a nice young girl from the village to do their housework. And no one in that village ever ate a candied apple again.